Angry Bear 2011, 2012: Mindful Money posted at Minyanville named Angry Bear among some of the top influential independent financial blogs. Angry Bear 2010: In 2010 24/7 Wall St. Journal named Angry Bear among the top twenty independent financial blogs on the net. The Angry Bear www.angrybearblog.com. Half a dozen professionals, including a tax law expert, a historian, PhDs in economics, business consultants and financial professionals provide perspectives on the financial world. Despite their expansive coverage of economic issues, their articles are as deep as their coverage is extensive. Topics include world trade, industrial production, U.S. Government programs, and major regulatory issues. 2010 FINS from The Wall Street Journal named Linda Beale’s ataxingmatter in The Top Five Tax Accounting blogs to read for 2009-2010. Emeritus Contributors to Angry Bear include: Bill McBride, now at his own Calculated Risk, Kash Mansori who now writes sometimes at The Street Light occasionally, Pro Growth Liberal (PGL) now at Econospeak, and Mike Kimel. author of Presimetrics. who still writes for us but less often. In no particular order our current economists and contributors in macro, micro, and finance are Kenneth Thomas, Ken Houghton, Spencer England, Robert Waldmann, Linda Beale (tax and law), Rebecca Wilder (The Wilder View at Economonitors), Steve Roth and Jazzbumpa. Bruce Webb has added his nationally recognized expertise in particular on Social Security.. Beverly Mann writes on Supreme Court proceedings and the political aspects. Mike Halasy and Tom Ealy cover the health industry. Dan Becker offers his perspective as an owner of two small businesses, and Edward Lambert adds his perspective on effective demand. There seems to be an extremely important disagreement between MMTers. In this article I will attempt to give readers a better understanding of what MMT is and is not. The government shutdown is the economic equivalent of sustaining -800,000, or -0.5%, layoffs. The last time we saw that was in the Panic of 2008. In October personal income increased 0.5%, and personal spending increased 0.6%. These are both very strong increases. Further, real inflation adjusted income and spending both also rose. While the latest ISM reading of 57.4 is a very positive reading on an absolute scale, nevertheless this was the lowest ISM new orders reading since November 2016, almost two years ago. It is long viewed that what the electoral populace thinks of the state of the economy is an important factor in how they vote and electoral outcomes. When The Stock Market Headlines The Political Blogs . . . When you see a daily stock market move leading the political blogs, it’s a sign of a bottom, not a top. That’s because it’s a sign of emotion, and it means that amateurs are paying close attention. Amazon Defeated In New York (Updated) was just posted to Angry Bear's personal blog. In the biggest ever defeat for a subsidized project in history, Amazon announce dFebruary 14th that it was canceling its planned half of HQ2 for New York City, which was to receive subsidies worth at least $3.133 billion. Real retail sales for November, together with the revisions for October, were very positive. As of November both real retail sales and real retail sales per capita set new records. Description: The authors cut through party bias to present the quantifiable facts about how modern presidents have performed on critical national issues Politicians and the media spend a lot of time telling Americans how the presidents and their administrations are performing, but this analysis always skews along party lines. 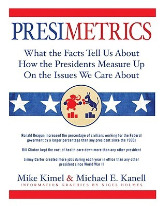 In Presimetrics, Kimel and Kanell take a fresh look at modern politics by gathering data from numerous government sources in order to compare and rank presidential performance on critical issues, from employment and health care to taxes and family values. The results frequently defy expectations. The lively text clearly explains how various policies of each administration affect the data, and fascinating information graphics lend even greater depth to the discussion, showing at a glance how multiple administrations stack up.